Celebrating the 50th anniversary of the first man on the moon was the focus of Crisp Museum’s Historic Talk, Tuesday, April 2, at Southeast River Campus. The talk was led by Gary Tyler, who has been an outreach specialist at the museum for 11 years. As an outreach specialist, Tyler operates The Southeast Explorer, a mobile museum that provides Crisp Museum education to local schools. Along with presenting the exhibits, Tyler also distributes supplementary teaching materials to teachers. The talk was centered around the fascination with space in the ‘50s and ‘60s. He also discussed the space race, and how this led to the mission of sending man to the moon in July 1969. Throughout the talk, Tyler described a timeline of events between the U.S. and The Soviet Union. By the end of WWII the two countries fought over new technologies in order to get the first person into space. New forms of rockets were developed and tested, and in May 1961 the Soviet Union became first country to launch a man into space, beating the U.S. after. Tyler notes U.S. astronaut teams and their missions over the years. Tyler highlighted the importance of The Gemini Project, a program involving a new team of astronauts which flew low earth orbit missions from 1965 to 1966. This team had access to newly developed space capsules as technology continued to be updated. Even after the U.S. succeeded in making it to space, challenges continued. Tyler explained that learning how tedious it was working with the space atmosphere was what really set the U.S. back. After the failure of Apollo 1 which ended in fire, the U.S. desperately continued to make new technological advancements on rockets. In 1968, Apollo 8 successfully made its way around the moon from the planet's gravitational pull. Apollo 11 was launched in July 1969. Training for the launch was extensive and like no other mission before. Television footage showed the first footprint on lunar soil. Buzz Aldrin placed the U.S. Flag within the soil of the moon. After Apollo 11, five more missions successfully landed on the moon. Tyler ended the presentation by showing images of the footprint, the U.S. flag and a memorial plaque attached to a leg of the lunar module that was left by the Team. “It is important to celebrate anniversaries like this to remember what the nation has achieved together. We had to come together as a country to accomplish this,” Tyler said. He also explained these events are important to remember because they are part of our local history. “St. Louis was where the space capsules were manufactured, someone from Sikeston transported the capsules to the Kennedy Space Station, and astronaut Linda Godwin even graduated from SEMO,” Tyler said. After the talk, the audience proceeded to visit the Southeast Explorer which showcased objects from that period. 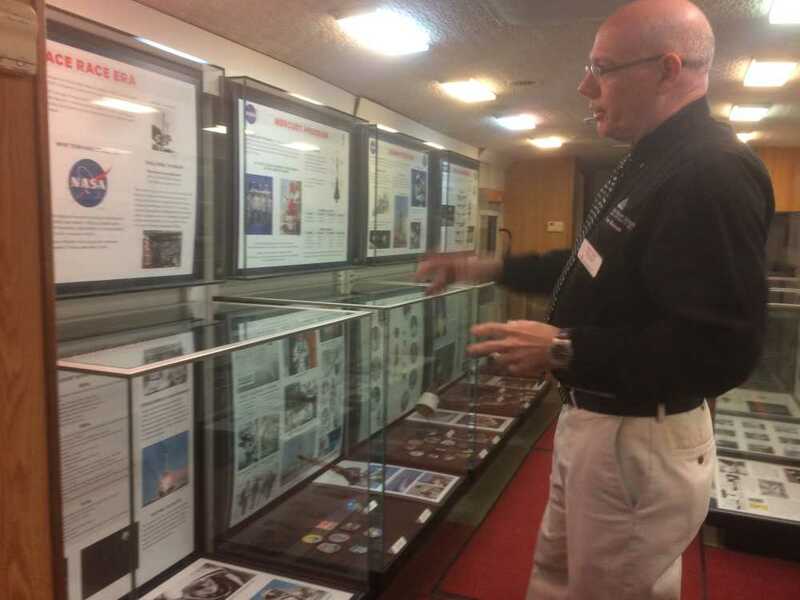 Some of these objects included children’s toys and novels around the subject of space, astronaut patches, and visual timelines of the progress NASA has made through space suits, technology and rocket development over time. Historic Talk Tuesday is held weekly at the Crisp Museum at Southeast River Campus at 7 p.m.